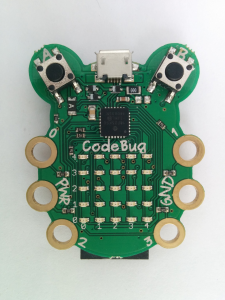 CodeBug – Get one now! A few days ago I was seduced by an offer for a CodeBug. CodeBug(s) arrived. Snazzy box. Unwrapped and took a look. Yes, it looks just like the picture. And comes with a USB cable, and a short instruction leaflet. Visited CodeBug website and followed the get started instructions, watched the short intro video, which at less than 2 minutes shows you in real-time how to write your first CodeBug program, test it, deploy it to your CodeBug and finally run it. I thought, 10 minutes. Is that all the fun there is to be had from a CodeBug. Done that. Next. Then I wrote a program to animate a dancing bear. A very simple dancing bear I admit. This time using loops as well as button press logic. I was beginning to be impressed with this little £15 device. So why not go further. On the website, which is clean easy to use, and has a professional feel to it, there are some learning examples. Next up is a Fruit Keyboard. I only had apples. So it was going to be a single fruit keyboard. A single key keyboard. 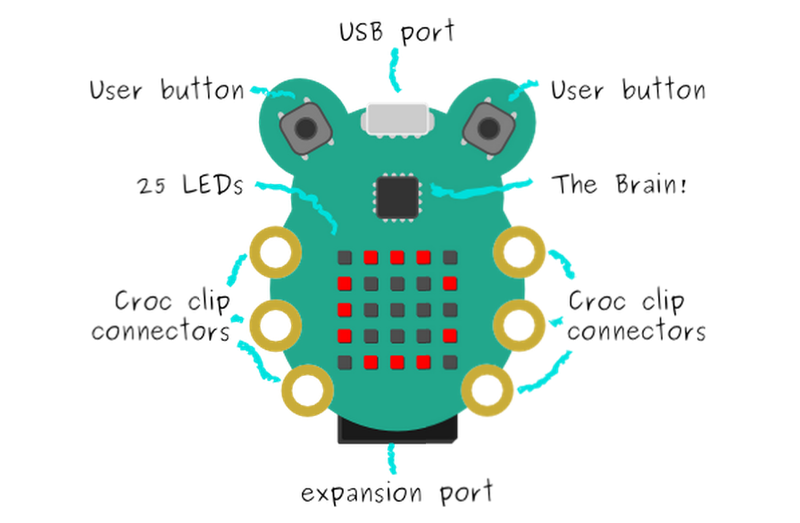 To make this ideally you connect a wire with crocodile clip ends to the CodeBug and the apple. I only had a jumper lead, so I snipped off one end, and wrapped the wire around one of the 4 input / output terminals. Then pushed the pin end of the wire into the apple. I modded the program to display apple. The tested the program in the on-line emulator, to ensure that it compiled first, and second worked correctly. Happy with a quick test, and desperate to try it in the real world, I downloaded the program to the CodeBug and set it running. Every time I touched the Apple, “Apple” was displayed on the LED display – scrolling across. This was the most immediate programming feedback I have ever had. 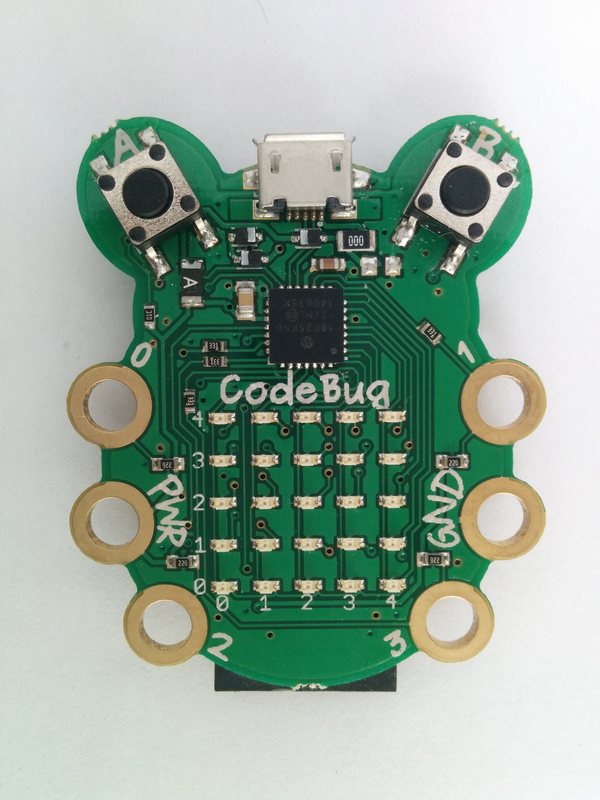 I was very impressed at the simplicity of the CodeBug, yet how powerful and flexible it was, combined with a visual programming language and emulator, including cloud storage for all of my CodeBug programs. This has been well thought through. But there is more. 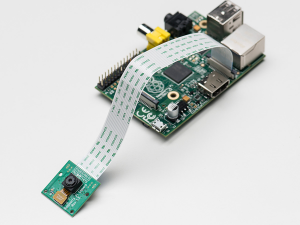 A code bug can be tethered to Raspberry Pi, and using Python programs running on the Pi you can control the CodeBug. Effectively a program is downloaded to the CodeBug which then works as a client, whilst you run Python programs on your Pi – server, and communicate through the USB cable to your CodeBug. Client Server computing. With a CodeBug. Amazing. I have to admit here to my first downer with the CodeBug. It plugged it in but it didn’t work. I spent a lot of time trying, but absolutely nothing was happening. I was obviously doing something wrong, but couldn’t work out exactly what. I was using a Motorola LapDock, powering a Model A+ raspberry Pi. 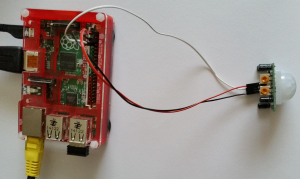 There are 2 ways to tether a CodeBug to a Raspberry Pi. 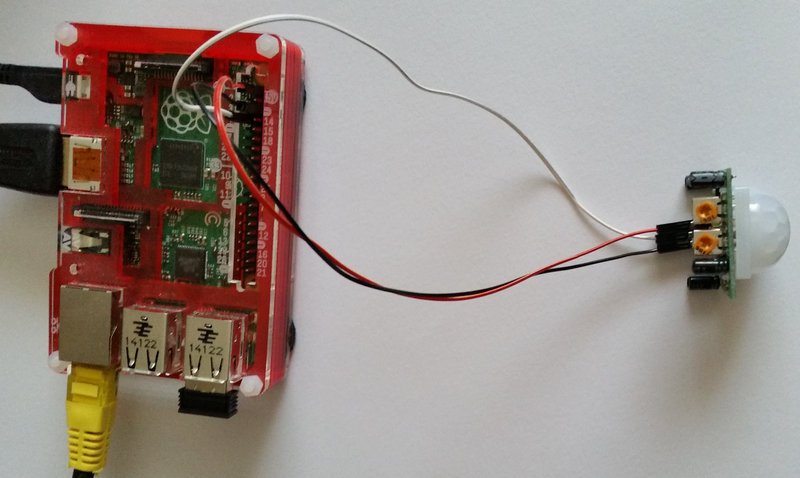 Tethered, and Tethered with I2C, one of the interface standards supported by the Pi. The CodeBug also has expansion pins on its base and can be plugged direct into the GPIO pins on the Pi. Nothing I tried worked, so I slept on it. Thinking that a bit of rest might help. Before retiring though, I ordered some CR2032 batteries, because the CodeBug can be battery powered so it can work without a computer connection – it really is quite an amazing little device, and I ordered a USB Cable with a switch on it so I didn’t have to keep on plugging it in and out to reset and download programs. The power of sleep is amazing. If you have a problem, then stepping away from it for a while can sometimes help. Meanwhile in the background your subconscious carries on working on your problem. Wednesday morning I decided to rebuild the Pi OS. I started with the latest Noobs (pi speak) build. And try again. So after installing Geany, a lightweight IDE for writing Python I was ready to go. I plugged in the CodeBug to the GPIO ports on the Pi, then turned on the Pi. Before the Pi had finished booting a dancing bear was showing on the CodeBug LEDs. This made me realise that I had forgotten to download the tethering program, and that I probably needed to read the instructions a little more carefully. In rereading the instructions I realised that tethering comes in two flavours on the Pi. Firstly, and I had missed this, partly in my haste, that the first tether mode I was attempting was using a USB cable. However I had plugged the CodeBug into the GPIO pins. So USB tethering was never going to work. But i2C tethering through the GPIO pins should have worked. So the software refresh wasn’t a waste of time, but I also needed to read the instructions more carefully. There were 2 references to connection via a USB cable. In a picture, that doesn’t actually show a Raspberry Pi, and then on the last line of the overview text of the example. The examples are very good, and well documented. I admit I rushed, and didn’t read the single reference to USB tethering. Lesson learnt: Use the latest build, and read the example text – thoroughly. Yes, I think that the USB tethering line could have been more prominent in the example, but there was a picture as well, and I had missed 2 clues! Once plugged in, via a USB cable, I followed the example python scripts and all was well. But that is the thing with CodeBug, you then think, “well I want to scroll some text like Blockly does“. Ah ha. When you write in Python the CodeBug tether library does not provide a scrolling program. So you have to write your own. An example is given, but it is more fun working it out from basics. The way you get text to scroll is by adjusting the pixel map start point. You display the same text over and over again, just decrementing the starting column, from 0, down to a minus value that is 5 (for five columns you have to scroll across) times the number of characters in the string. Therefore “Hello CodeBug!“, is displayed from column 0, to column (0 – (14*5)= – 70), in decrements of -1. Then it was on to trying out the direct GPIO connect and the I2C interface. 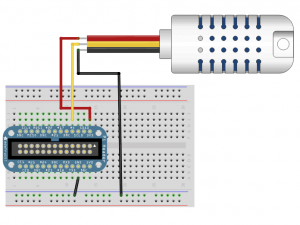 This means connecting the CodeBug directly onto the GPIO pins of the Raspberry Pi. Something that should always be done with care. And note that you should never connect power from the GPIO Pins, and either battery or USB. There is a warning on the page, but others seem not to be reading all of the text, just like me . . . . 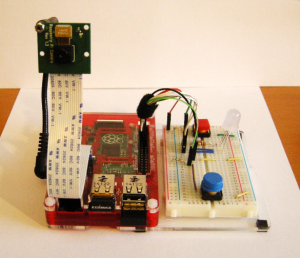 I followed the scrolling digital CodeBug clock example. 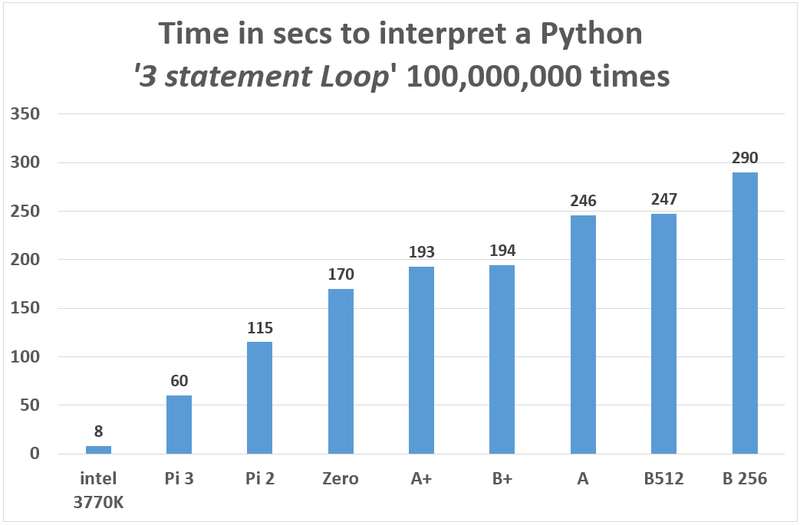 The python program gets the current time and date from the internet, then formats the time and date outputs and sends them to the CodeBug, scrolling them across the LED. I slightly modded the program to display the short month rather than digits, (%b not %B). On my Model A, it displayed the Time then Date almost exactly twice a minute. To within a fraction of a second. I only experienced one small problem. I set the scrolling time parameter to 15 (15 seconds), not .15 (point 15 of a second) which meant that the display stood still for 15 seconds and would have taken approx 20 mins to scroll the time string! Ooops. I was pleased that I had overcome the initial problems, software and not reading the instructions properly. And now could think of lots of things to do with the CodeBug, RasPi and Python. I think tethering via USB might be more useful than via the GPIO pins, but it is a useful capability. Being quite taken with Blockly I decided to investigate further. Following the links I eventually came across the Google Developer Pages for Blockly and the instructions for installing Blockly on your own machine here. The CR2032 batteries arrived meaning that the CodeBug can be used without plugging into a computer. This just worked! The USB leads arrived. I had bought the wrong ones. No data cable! They only provide power to the CodeBug, but don’t do data exchange. Oh well. Out with the soldering iron to make the lead I really wanted. Should have read the small print. These will be recycled to use with Raspberry Pis. 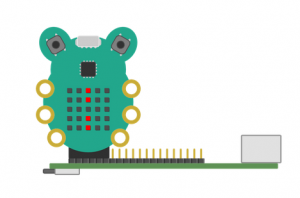 Write this blog post as a way of documenting the CodeBug experience and start to think of other things to do with the CodeBug. 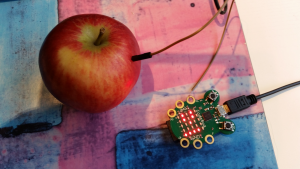 I am definitely going to try the ‘get coding in under 2 minutes’ out on some friends 🙂 And the fruit keyboard – the tactile immediacy, having written the code, seeing all the wires, is great fun. And I am thinking of doing more with my CodeBug. I bought 2. I gave the other one to my wife. She’s got the bug as well! In fact she got going a little quicker than me. Obviously reading the instructions more carefully!!! A lesson to be learnt there no doubt? One project I want to try is to tether 2 CodeBugs to the same computer, then scroll a message across both CodeBugs, so that it appears as if the text is crossing from one to the other. If I get that going I will add a video, so watch this space . . . . I am very impressed with the CodeBug. It is immediate. It is tactile. It is fun. But I am not only with impressed with the device, but also the complete environment surrounding it. The interactive, visual, development environment, including compiler and simulator is great. The Cloud storage of your code is excellent. The price, £15, is fantastic. The examples are easy (ish) to follow – as long as you actually read them and not skip ahead. It is a well designed system, which just works. If you have read this far and haven’t already ordered a CodeBug, then stop reading, and buy one now. This entry was posted in Blog, Other Stuff, Raspberry Pi, Uncategorized and tagged @Raspberry_Pi on 9th October 2015 by admin. I have had a Raspberry Pi camera board since they were first available in May 2013. 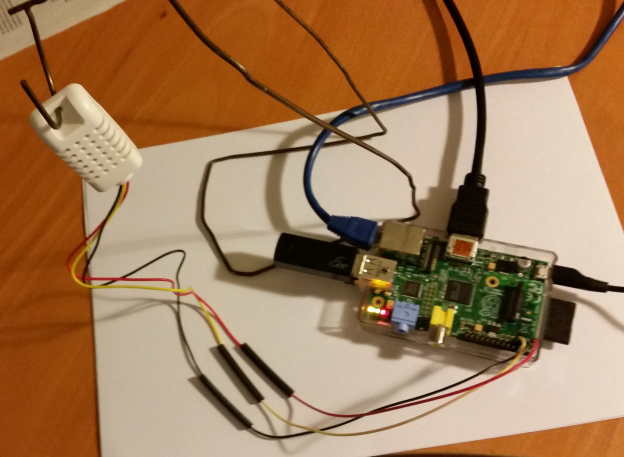 One of the big advantages of the Pi camera is that it can be program controlled. That means you can write a program, in my case in Python, that can control when you take one or many photos. I had seen a post on time-lapse photography and thought “I can build one of those“. So I did. I think it looks fantastic when it is finished. If you can’t wait, fast forward to 42″, and watch a rain shower followed by brilliant blue sunshine. Don’t forget to watch in 1080p if you can. It took about 75 lines of python code and now I have a time-lapse camera program. Thanks for the inspiration and example code link here. Well, I have the program which takes the pictures. The images then need to be stitched together. And finally converted to something like an MP4 file. Why 75 lines? Sounds like a lot? I wanted the program to be variable, so using inputs I can decide how many shots to take, and how far apart the shots are taken. This allows me to do a trial shot. Look at the results, check that the camera is pointing in the right direction, then go for the full run, for example 2,400 shots at a 6 seconds delay. Most of the code actually sorts out file names and directories. Just to be difficult I decided to use numbers for my file names, not just a time date stamp, so a lot of the code enables that. It is possible to write a much shorter program, or even just use the time-lapse feature in raspistill. To make an 1080P HD movie you need to take 1920(w) * 1080(h) pictures, and stitch them together at 25 frames per second (in the UK). So for 1 minute of video you need to take 25 * 60 = 1,500 pictures. At 6 seconds delay between shots this is going to take 2½ hours. My set-up is simple, a Pi, WiFi dongle, and an Duracell emergency mobile Phone charger battery. I run the Pi headless, which means without a monitor and keyboard. I connect through either my laptop or a tablet. And if I am out and about then I can use open a hotspot on my phone. 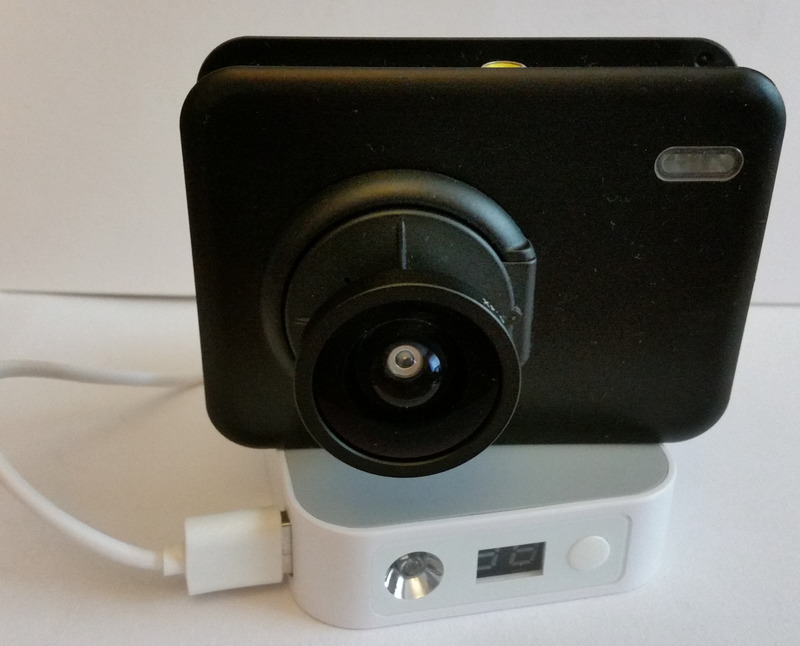 I even bought a case for my Pi that looks like a camera. Not bad for about £10. Just a note: You can do all of the video encoding and conversion on the Pi, but I use my desktop PC. It is a lot quicker. 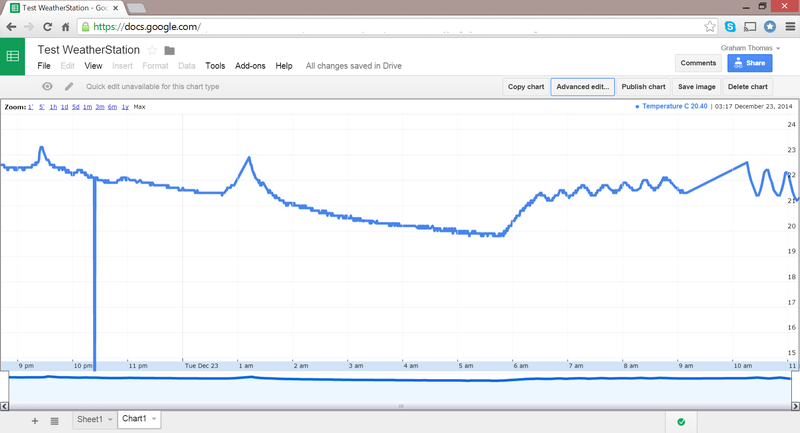 For example 50 minutes+ on the pi = 5 minutes on the desktop! And all of the software is open source i.e. ‘free‘. The only additional expense need be the RasPi Camera Board. 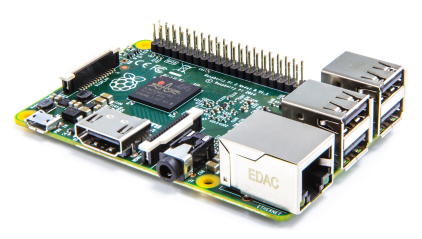 “This is great, but I can do all this with my tablet and I don’t need to fiddle about with any of this Raspberry Pi stuff.” Well, yes, you can. But you are much less likely to stick your tablet in a Tupperware box, and leave it in the middle of a field for 24 hours, than you are with a Raspberry Pi. And where is the fun in using a tablet? With the Pi you have the satisfaction of knowing that you ‘made it‘. This entry was posted in Camera, Raspberry Pi and tagged @Raspberry_Pi on 12th May 2015 by admin. I recently ran a workshop, with my good friend Phill Isles, at the Test Management Summit. The subject was Testing the Internet of Things: The Dark and the Light. One of the things that we wanted to do was demonstrate a live Internet of Things device, that the delegates could actually interact with, see how it works, and begin to understand what IoT means. 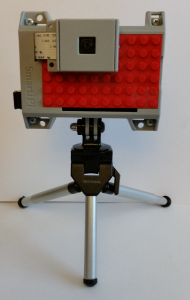 So I thought I would build a Raspberry Pi Tweet Cam, that the delegates could use to take selfie’s. It would need a Pi Camera, obviously. Then a button to press to take the photo. An LED to show the user what was happening. And finally another button so that we could turn it off. The aim was to run headless, i.e. no monitor, keyboard or mouse. Finally it would be equipped with a Wi-Fi dongle, to enable it to connect to the internet and Tweet. 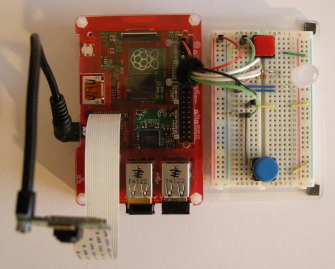 A fun Raspberry Pi project. I mostly used the instructions for Tweeting from Alex Eames RasPi.TV site (which I find extremely helpful). Details can be found here RasPi.TV Taking and Tweeting a Photo. Then added my own design and functionality. The pi looks great in the coupé case. 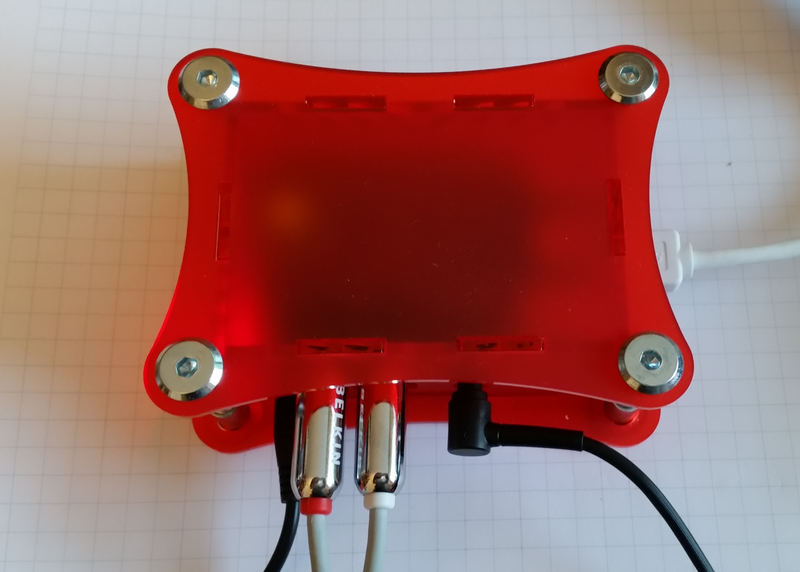 Which replaces the bottom layer of the Pibow Coupé case and gives a larger platform onto which a half-size breadboard can be affixed. I got ones with round and square tops. Why install three LEDs when you can fit one that does all three colours. You still need 3 input connections though – one per colour. I didn’t quit have the right resistors. I managed to use two in parallel. And ordered a jumbo multi-pack of 2,000. The Build. Once all of the parts had arrived, I thought on the matter for a few days. When I had a rough idea of what I was going to do I started the build. I used a rapid prototyping approach. I then added a resistor, button and some wiring to the breadboard, and some jumpers to connect the breadboard to the Pi. Wrote some code to detect the button press. Then added code to taka picture when the button was pressed. Next step was to add the RGB LED. There were no instructions for the RGB LED on the vendors site. I e-mailed them, and they responded with a two page .pdf, which had the orientation, and forward voltage. Not all RGB LEDs are the same. A simple internet search shows that. After following some on-line guidance I connected the RGB LED, adding a resistor to the Red bulb. Then wrote a simple LED test program. 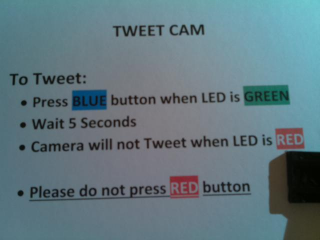 When that was working I updated the TweetCam code to turn the LED Green when Ready, Red when not – I had decided that the TweetCam would only take a photo every 2 minutes, so as not to spam the world. And the LED would flash Blue when it was taking a photo. Wrote the code and tested it. Then I added a second button, which was used to shut-down the Pi, as it would be running headless and this is always a good thing to do when turning off a Pi. And I made the LED flash Red whilst the Pi was shutting down. Finally with the program doing everything but Tweet I added in the Tweet code. I followed the excellent instructions from Alex Eames. And yes, it worked. I pressed the button, the Pi took a photo, flashed the LED, and tweeted the picture. This is ‘Testing in Production’. It is difficult to test a tweeting program without getting comments! So I only tweeted a few photos. I actually created a version of the program with the Tweeting line of code commented out, so that I could test changes, without bombarding Twitter. The build took 6 hours from start to finish. I was quite impressed with the speed at which a functional and usable IoT (Internet of Things) device could be built and tested. We used the device in sessions on two days. On the first day the internet was not working at the conference venue. It was a all a bit of a damp squib. We were though able to demonstrate the inner workings of the Tweet Cam to the delegates but were unable to Tweet. Day two was perfect. Press the Blue button and tweet a picture of yourself. This entry was posted in All Projects, Camera, Devices, Raspberry Pi, Testing and tagged @Raspberry_Pi on 9th May 2015 by admin. A few days ago I met my good friend Phill Isles for coffee to plan an upcoming workshop centered around testing IOT devices. Phill is quite interested in electronics and at the end of our meeting he handed me a small circuit board with what looked like half a small golf ball on one side (something like an icosahedron). It turns out to be an PIR motion sensor (Passive InfraRed sensor). He recently bought 5 and thought I could have some fun with one (Thanks Phill). And all for only 80 pence each including shipping. Later he sent me a link to the adafruit website with a tutorial for the PIR sensor. 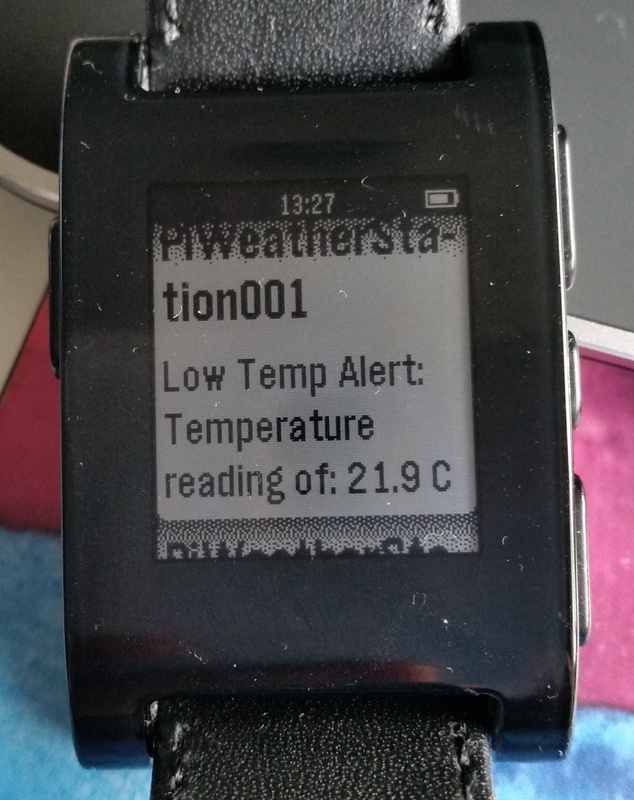 I wired the PIR sensor into my Raspberry Pi, then slightly modified the example program to print a ‘Movement Detected‘ message on the screen. And then started to test the sensitivity of the device. As I moved away from the desk I could see the ‘Movement Detected‘ messages being displayed on the screen. But when I got 15 feet away I could no longer read the screen. Had a message been displayed? It was hard to tell. How can I test the range? I was on my own with no-one to help. 2 minutes later I had a pair of binoculars to view the screen and all was well again. 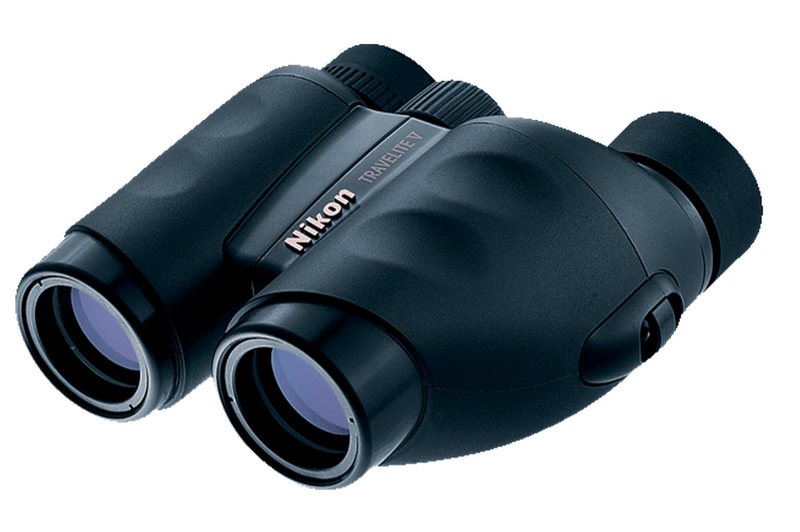 It was the first time I have ever used binoculars for testing software. And a new tool was added to my software testing kit-bag. 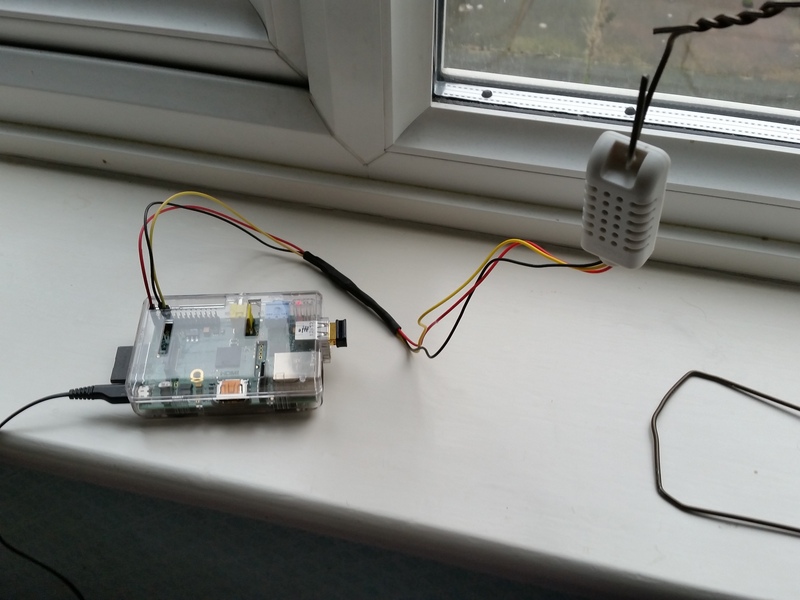 This entry was posted in Blog, Raspberry Pi, Testing and tagged @Raspberry_Pi on 18th March 2015 by admin.